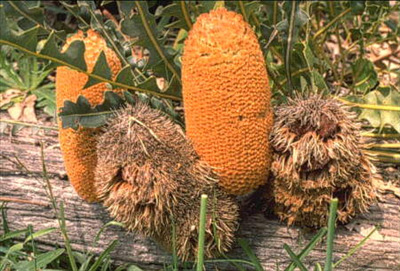 Ornamental groundcover banksia with reddish brown to pink and brown flower heads in autumn-winter. Suitable for well-drained light to heavy soils in partial shade to full sun. Grows well inland (Ojai) or coastal situations and is moderately frost and drought tolerant. Excellent for container plant or embankment planting.